The Hiden HPR-20 R&D specialist gas analysis system is a bench-top mass spectrometer for the monitoring of evolved gases and vapours. A triple filter mass spectrometer is included providing improved resolution and abundance sensitivity with an ultimate detection limit of 5 ppb subject to spectral interference. 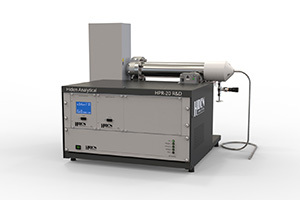 The HPR-20 R&D is offered with a wide range of interfaces for connection to thermal equipment and is configured with Hiden’s heated Quartz Inert Capillary (QIC) for continuous sampling of gases and vapours. Backing and bypass pumping is provided by a high performance scroll pump. Gas sampling is continuous with a gas sample flow rate user configurable/selectable in the range < 1 ml/min to > 20 ml/min. The system is supplied with MASsoft Professional Edition software. Gas transport in polymeric membranes. Gas transport in polymeric materials.